Lavender Scented Bag + Lucky Pebble Owl – Pegasus Florist - Naturally Dried Lavender in Malaysia! Wardrobe, shoes cabinet, car and etc. 3. Why my hand feel slightly oily when squeezing the lavender scented bag? 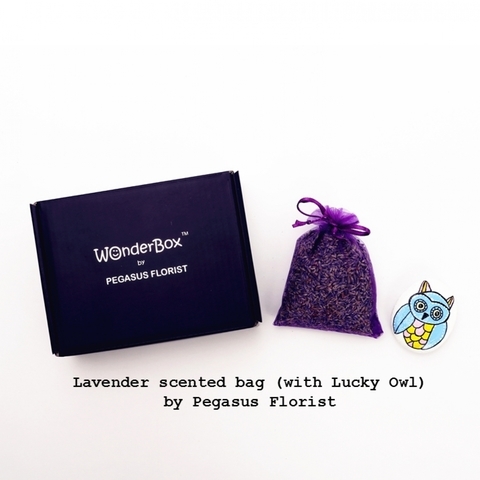 When you squeeze the lavender scented bag, this will release their natural lavender essential oil with refreshing scent. That’s why you may feel slightly oily on your hand. Never wet your lavender. It is advisable to put them in a dry & ventilated place. Please bear in mind that our dried lavender buds do not undergo chemical treatment to ensure no chemical residues remain. So, please avoid humid area as bugs and mold love a humid home. If you notice any, it's time for you to expose them to sunlight for a while, so that they stay dry all the time. Also, gently pat the lavender scented bag once a while to remove any trapped dirt & dust. 5. Is the size of each pebble owl the same? We are using the natural pebble for our owl painting. So, the size of each pebble owl is not the same. Generally, they range from 5cm to 6cm (height). 6. Is the pebble owl fully painted? The front of the pebble is fully painted & decorated while the back is left unpainted. This is to maintain the natural appearance & texture of the pebble, as well as for us to write your message. 7. How to clean the pebble owl? 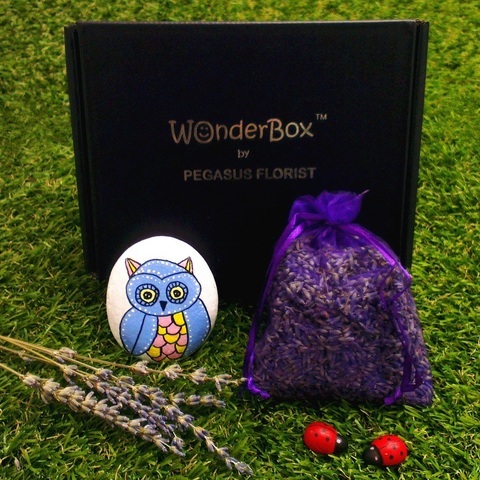 Our pebble owls are hand painted with high quality acrylic paint & protected with glossy varnish coat. They are water resistant & easily cleaned by wiping with soft cloth. 8. What is the length of the message to be written on the pebble owl? 9. What if my message is more than 8 words?